Preheat oven to 375 degrees. To make stuffing: Melt butter in a large skillet over medium-high heat. Add celery and onion; cook until soft, about 4-5 minutes. Add sausage and cook until browned, about 5 minutes. Add apples and continue to cook until soft, about 4-5 minutes. In a bowl, combined sausage/veggie mixture, egg, bread cubes and sage and mix until combined. Add chicken stock and season with salt and pepper. Transfer mixture to a greased baking dish. Place in the oven and cook for 30-35 minutes, until top is browned. To make cranberry glaze: In a medium saucepan, bring cranberries, orange zest and juice and sugar to a simmer. Cook 10-15 minutes, until cranberries burst. Use an immersion blender to puree cranberry mixture. Set aside. 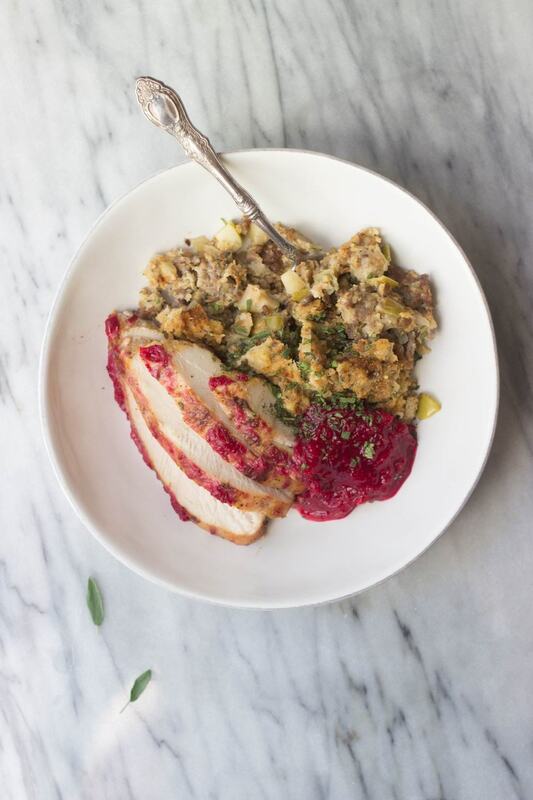 To make turkey breast: In a large cast iron skillet, heat oil to medium-high. Season turkey breast generously with salt and pepper. Place in hot cast iron skillet and sear all sides until browned and crispy. Spoon half of the cranberry glaze over the turkey. Roast in the oven 20-30 minutes, until internal temperature reaches 160 degrees. Remove from the pan, spoon remaining cranberry glaze over the turkey breast, and let rest 10 minutes. Slice and serve with stuffing.